Melanie C. Atlanta, GA If you're looking for a VW repair place, go to Juniors and skip MINHS. Mae R. Brooklyn, NY My car broke down right near Junior's and they were super helpful. providing all the necessary manufacturer specified services. Big Earl M. Brooklyn, NY Highly Recommend! Desiree B. Brooklyn, NY Great service and very clear about pricing. I stumbled upon this place 20 minutes after purchasing a used car from a shady dealer. The engine light and TCS warning light had just come on. Since Junior's isn't located anywhere near my neighborhood, I told the mechanic that I just wanted to check if the car was safe to drive home, considering the warning light. The mechanic checked the error code and explained exactly what was wrong. I won't bore you with the details, but suffice it to say that he knew exactly what he was talking about and explained it very well. I got the impression that he was very honest, and he didn't charge me anything for the service. Great service and very clear about pricing. I took my wife's beetle in today for service and I got everything I needed plus the information of what I'll need to take care of in the near future. Sean took care of us and helped by explaining what was going on with the car and letting us know up front how much it will cost. I highly recommend Juniors, this is our go-to place now. 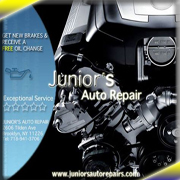 Junior's is one of the best auto repair shops in Brooklyn. I was driving a friend's car and I had made a mistake with the gears so the check engine light went on. Without waiting more than 5 minutes the mechanic took the car on a test ride with me and realized it was just a simple error I was making. He didn't charge me anything for it. Many mechanics would have tried to take advantage that I knew nothing about cars and was a woman and charged me for something I did not really need. Juniors was honest, respectful, quick, and knowledgeable. I highly recommend it. This is one of the best auto repair shops in Brooklyn. I needed a new battery. I went in and they replaced it in 15 minutes at a good price. They checked my fluids and cleaned off my engine without my even asking. And then they backed my car out of the garage and onto the street. The mechanics were friendly and knowledgeable and willing to explain what they were doing. As a car owner for over 20 years, I've never had a better experience with a mechanic in Brooklyn. I will definitely come back.